Keep in mind that hair loss is only temporary and should not ruin your life. Play with different colors, fabrics and lengths to stay cool and trendy. 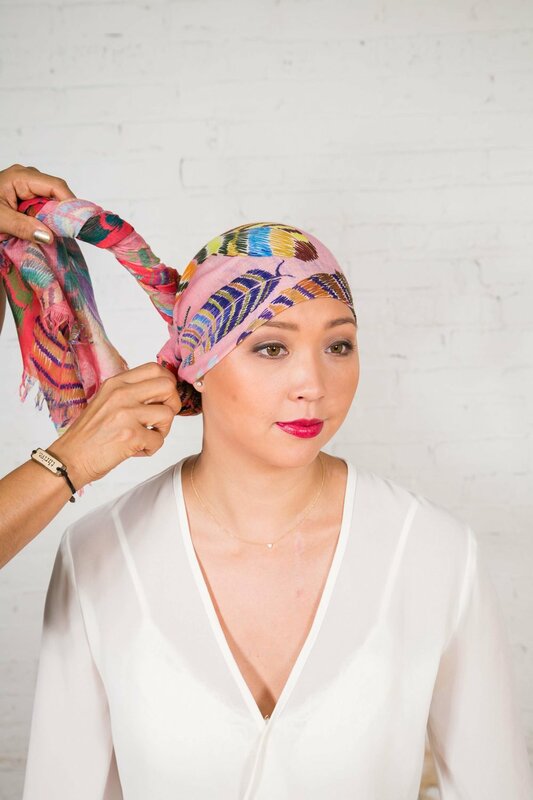 Headscarves are an alternative solution to wigs when suffering from hair loss, allowing you to stay feminine and stylish throughout your chemotherapy. 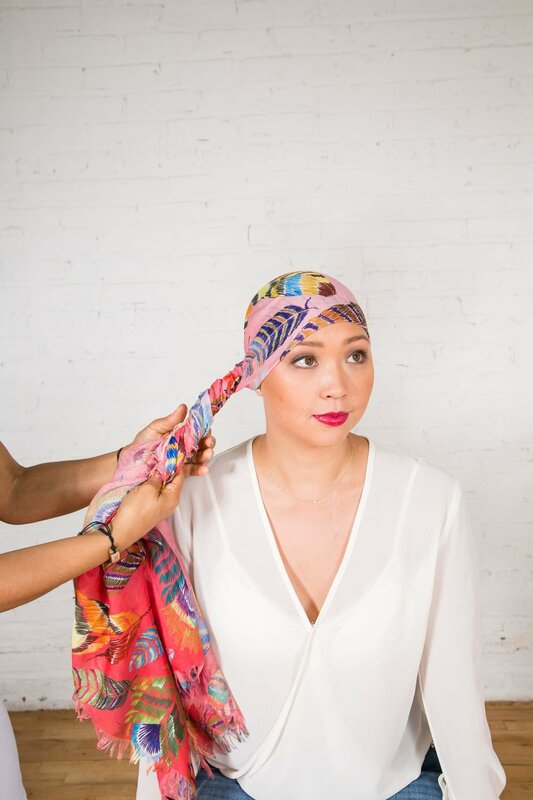 Pleasant, comfortable and soft to wear, such square scarves, pashmina or turbans are perfect during and after hair loss caused by chemotherapy. A classic classic head scarf is usually a pre-formed head scarf with 2 long sashes that can be tied around your head. The styles are varied: loose long ties at the base of the neck, knotted at the top of your head, knotted in the shape of a rose, crossed over the head. You may want experiment with 30” square scarves or oblong pashminas 17″ wide or greater and get creative and stylish. 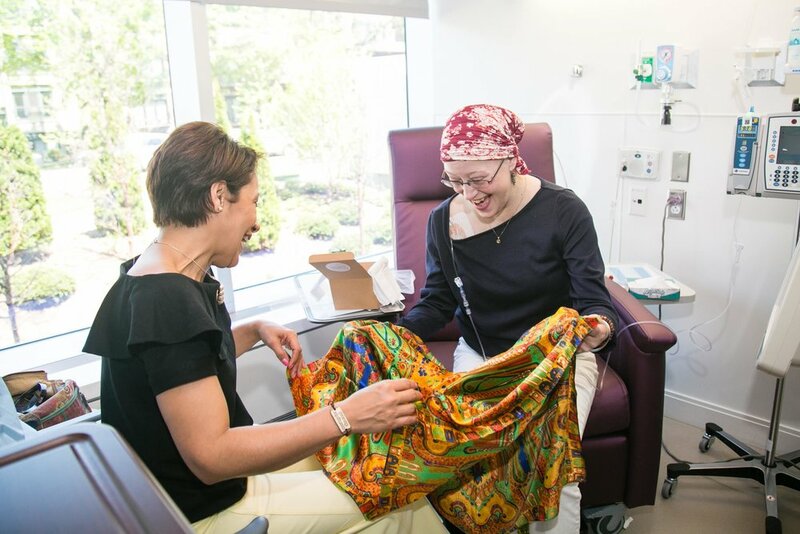 Turn your chemo scarf into a trendy accessory by accessorizing it with earrings, a necklace or even a hat. Choose colorful, larger, more striking accessories to turn your wraparound into a real fashion item. 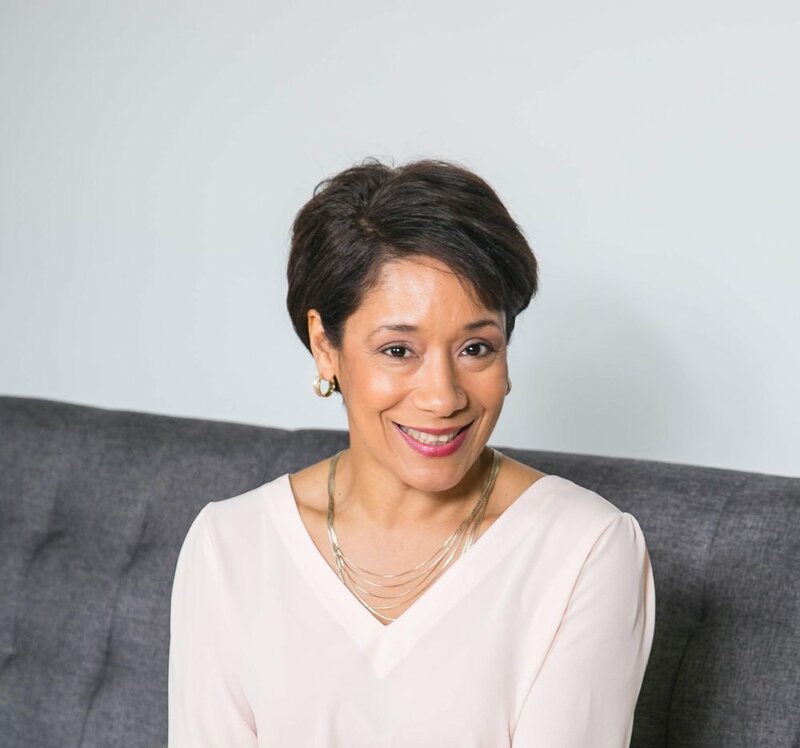 Our goal is to, in some way, ease someone's journey, provide a ray of sunshine through a beautiful scarf, inspire hope, and courage to keep fighting cancer. We know you want to feel as beautiful as you did when you had hair. Courage for the Soul wants you to know you are not alone. Request your scarf today and shine on! 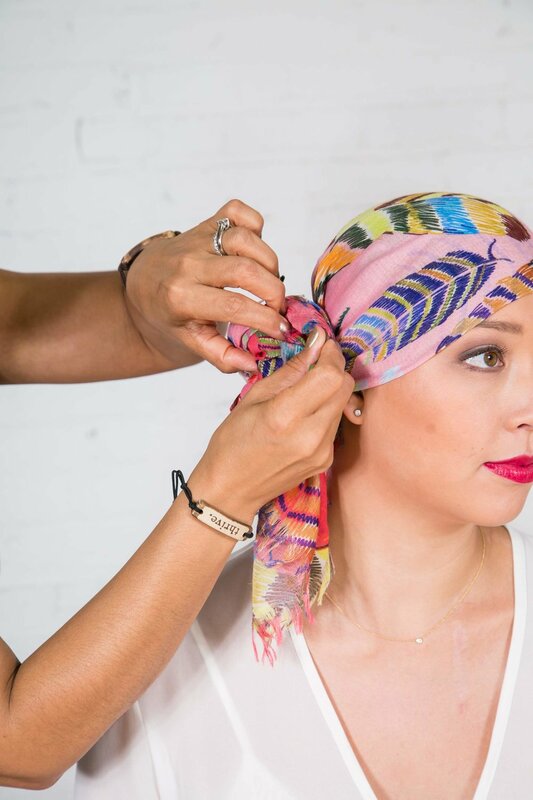 Click here for 5 EASY ways to tie a headscarf/turban/head-wrap! WATCH FULL TUTORIAL. The beautiful Nallie Agustin, breast cancer survivor teaches the Top/Front Bun aka the Top knot - The Side Bun - The Crown - The Side Ponytail and the Faux Hawk. 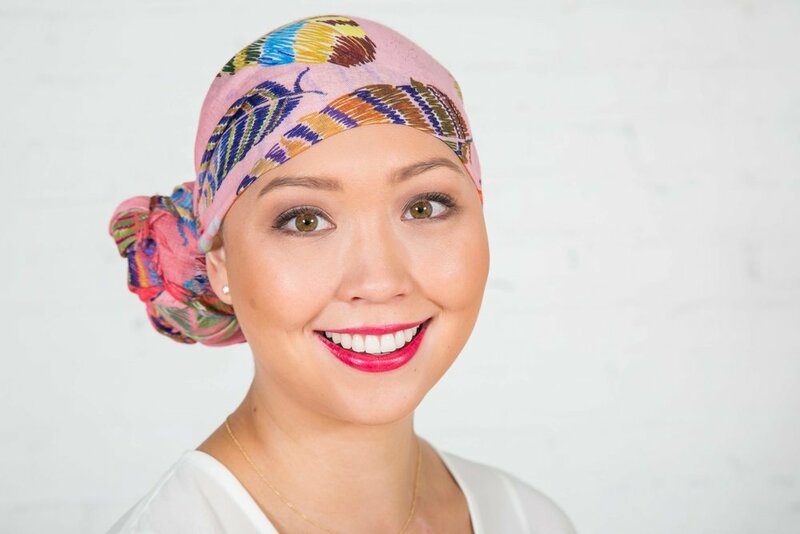 These styles are perfect for women with cancer undergoing chemotherapy, bald or with hair. Head scarves are a trendy accessory and looks amazing!